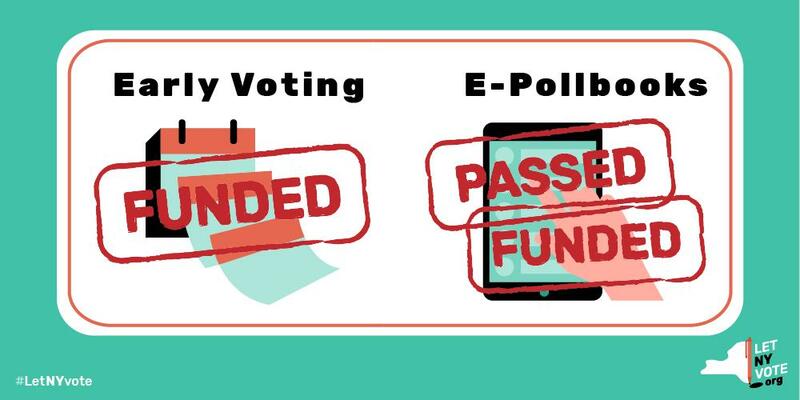 Congratulations to the Let NY Vote coalition, whose efforts secured nearly $25 million in funding for key parts of their reform package, with $10 million for early voting operational costs and $14.7 million for electronic poll books. We also want to recognize the Brennan Center, CPD, Common Cause NY, CWA, Daily Kos, Democracy Matters, Demos, LWV, NAACP (Albany, Brooklyn, NY), NAN, Public Citizen, SEIU, UAW, and Working Families Party for their work in pushing for comprehensive, bold democracy reform for New York. Let NY Vote's victory for Early Voting in particular marks an major step forward for the reform's adoption nation-wide. $24.7 million for voting reforms: $10milion for early voting operational costs and $14.7 million for electronic poll books. Uniform polling hours during primary elections: Next year, all New Yorkers will be able to vote from 6 a.m. to 9 p.m. during a primary election. Currently, the vast majority of the state can only vote from 12 p.m. to 9 p.m. during a primary. The press release from the coalition can be found here. Congratulations to our partners in Maryland on the successful implementation of Election Day Registration! In November 2018, 1,456,168 voters approved allowing eligible Marylanders to register and update their voter registration on Election Day. But the campaign for ballot initiatives doesn’t end after an election; all campaigns need to be successfully implemented to ensure the will of voters becomes a concrete reality—and our partners and allies have just accomplished this. The two bills that compose the Election Day Registration initiative, SB449 and HB286, passed in both the Senate and the House , and now heads to Gov. Larry Hogan’s desk, where he’s expected to sign them into law. We expect EDR to pass in the next few days! The other midterm campaign the DI coalition worked on, in conjunction with local activists and coalition allies, was the Yes on Question H campaign. 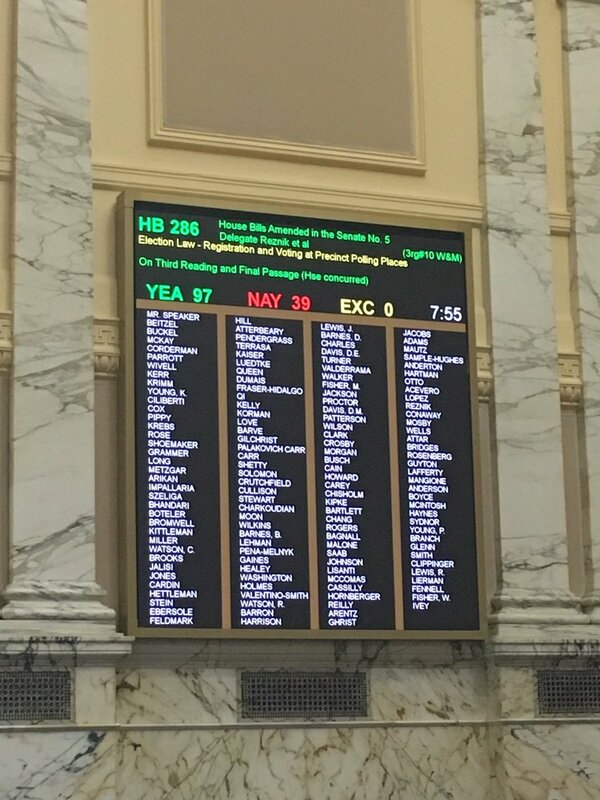 Baltimore City voters approved Question H (75.4%), authorizing the Council to establish the Fair Election Fund and commission, to encourage and support local candidates for office not beholden to wealthy special interests. 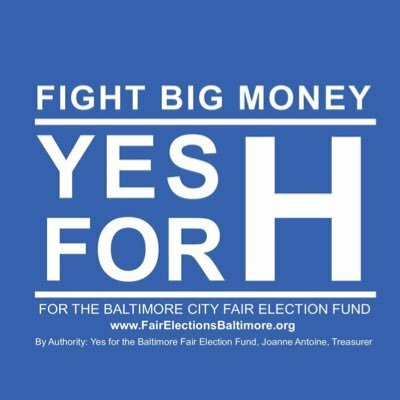 The need to get money out of Baltimore City politics has never been more clear than now, and the establishment of the Fair Election fund is a crucial step to severing the connection between money and politics and return power to the people. "In a system where the people with money call the shots, it will always be the voters—particularly those from Black and Brown and poor communities—who pay the price. We see it in lack of investment, over-policing, and in the lost faith in our elected leaders & our government. And we wonder why voter participation from these communities is so low. Our leaders can eliminate the pay-to-play culture that has stifled cities like Baltimore. Policies like the Baltimore Fair Elections Fund, which would replace corporate donations to city candidates with a citizen-funded model can give power back to the voters. NYC, Seattle, Montgomery County, and other cities across the nation have implemented this model with great success. Mayor/Council President Jack Young can demonstrate leadership by passing & signing this legislation." "Our democracy is in a fragile state: here in Baltimore and down the road in DC. Sometimes things have to get bad before they can get better—and I am hopeful we can build the city and country we deserve from the ground up. In the next few months we will have one clear opportunity—debating and passing the Baltimore City Fair Election Fund Program through City Council to ensure everyone has equal opportunity to participate in elections and keep large and corporate contributions out. I hope the entire Council and Ex-officio Mayor get behind this critical reform. I also hope that Baltimore City residents engage in productive conversation and debate on how to fix the City’s problems. Now is the time to engage and confront the challenges before us." The bill to establish the program will be introduced at the end of April by Councilman Burnett. Currently, we are looking for Baltimore City residents to serve on the commission that administers the program. If you have any recommendations, please send them to Joanne Antoine at jantoine@commoncause.org. Baltimore County Council approved CB 3-19 for the Citizens’ Election Fund (5-2 vote). The charter amendment will be placed on the ballot in 2020. If established, the program will be available for use in 2026. Montgomery County's Public Election Fund was largely a success. Of the 68 candidates that ran for either Executive or Council, 38 filed an intent to use the program, 23 qualified and received matching funds. The County is now in the process of collecting feedback from candidates/the public with a goal of making amendments to improve the program this year. They have also committed to ensuring the program is fully funded before the next election cycle. Howard County has appointed members to the commission that will administer the Citizens' Election Fund. The County Executive has also opened donations to the program, allowing residents to donate when paying their quarterly water and sewer bills. Leaders in the state will be working to ensure the program begins to get funded this year. Prince George’s County Council approved CB-99 (originally CB-4) which established the Fair Election Fund. The program will be available for use in 2026, but leaders in the state will be working this year to try and move up the effective date. The Iowa House overwhelmingly passed a proposed constitutional amendment that would restore voting rights for returning citizens who have completed their sentences, and would come in the wake of the historic ballot initiative campaign in Florida where 64.6% of Floridians voted to restore the ability to vote to returning citizens. TAKE ACTION: the ACLU of Iowa is asking Iowans to email members of the Senate Judiciary Committee before Friday and urge them to vote YES on HJR 14. The emails of these Senators are available here. The measure passed the Republican-controlled House on a 95-2 vote Thursday, March 28, and is now eligible for consideration in the Iowa Senate, where it’s expected to face tougher opposition, but first it needs to advance through the Senate Judiciary Committee before Friday, April 5. The bipartisan vote in the House demonstrates what rights restoration activists have found in states across the country: that all citizens who’ve paid their debts to society deserve the same rights all Americans share, including to be represented in government. As we have said before: democracy demands transparency. Congress and the public must be allowed to see the full findings of the Mueller investigation, to draw their own conclusions and to reinforce the need for election security and infrastructure investment. 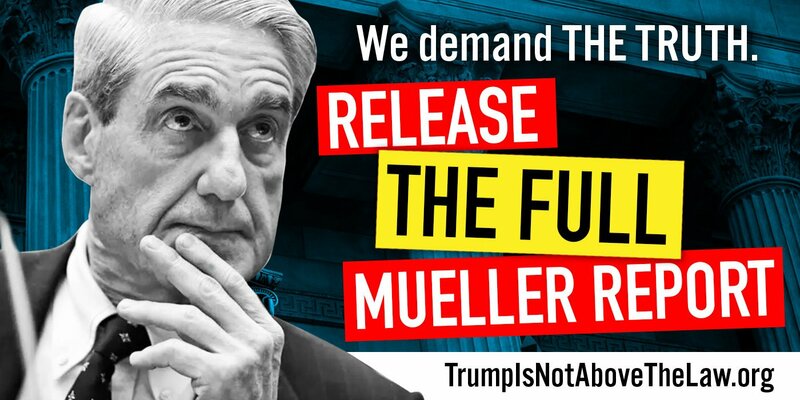 The full Mueller report and underlying documents and evidence must be made public, and the coalition is gathering to make sure that happens this Thursday, April 4, at 5 p.m. throughout the nation in more than 200 cities. Find an event near you or host one yourself. House Judiciary Chairman Jerry Nadler, along with 5 other House committee chairs, replied to Barr's letter by reaffirming their expectation for full transparency by April 2nd. In light of these developments, the coalition is holding a National Day of Action today, this Thursday, at 5pm local time. The #ReleaseTheReport Day of Action, organized by DI partners AFT, American Family Voices, Bend the Arc, CPD, Common Cause, Daily Kos, Demos, Free Speech for People, Friends of the Earth, Greenpeace, Mi Familia Vota, MoveOn, PFAW, Public Citizen, SEIU, Sierra Club, Working Families Party, and coalition allies is planned for this Thursday at 5pm local time. 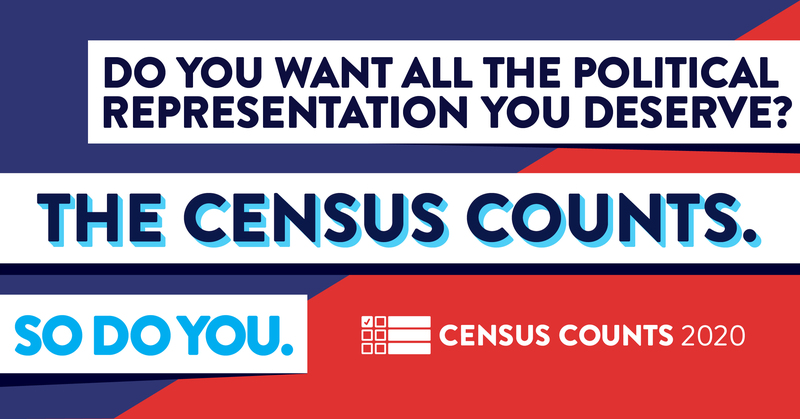 Monday, April 1 was the Census 2020 Day of Action, where DI partners and allies took to social media and events all over the country to educate around the importance of the 2020 Census and its role in ensuring accurate representation and resources for all Americans. We want to acknowledge DI partners Arab American Institute and National LGBTQ Task Force for leading on this work, and for over 25 DI partners for participating in the April 1 day of action. The work on ensuring everyone counts is only just beginning. For ways to get involved, contact Beth Lynk and Sonum Nerurkar, and direct your members to visit www.censuscounts.org. Our partners at Common Cause put together a video on why the Citizenship Question, a racist ploy by voter suppression architect Kris Kobach and the former White Hosue adviser and fascist Steve Bannon to strip political representation from our immigrant communities, must be resisted. You can download the video to share by clicking here. The Democracy Initiative is a unique, broad and diverse coalition of 70 organizations committed to strengthening U.S. democracy by growing the grassroots activist base. We are seeking a high-energy, creative, experienced leader committed to bottom-up organizing to coordinate our democracy training, leadership development and movement-building activities.